I'd like to welcome you to our award wining website. As Exalted Ruler for 2019-2020, I have planned numerous great activities. This all part of of my motto for the year "Uplifting Elkdom!". These activities will help spread the word of Elkdom further out in our community. Our charities are very dear to us as Elks. We reach out to Veterans, Youth Groups, Kids with disabilities, Fire and Police departments and many other local community groups. You too can be a part of this great movement we call ELKDOM. While you're here at our website, I'd also like to ask you to please sign our web site's guest book. 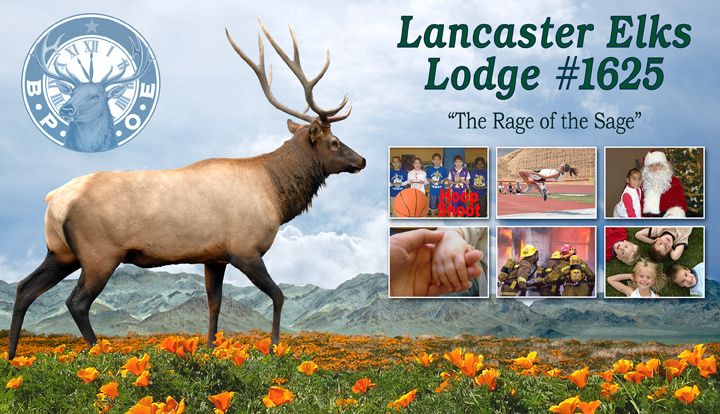 Check our Calendar Page for upcoming events such as Karaoke, Dances, and other Lodge Activities. Stop by for a visit and meet our great members and officers and enjoy our facilities. There's always someone here to sign you into the Lodge Guest Book. We as Elks, promote and believe strongly believe in BROTHERLY LOVE, JUSTICE, CHARITY and FIDELITY. These are the cornerstones of our benevolence. After all, we are the Benevolent and Protective Order of Elks. It's a great honor to be this year's Exalted Ruler of one of finest Lodges in the Inland District. We are growing in strength each month with new members joining our family of caring and giving people. I look forward to seeing you this fraternal year. WiFi available throughout the Lodge and the RV Park. Don't hang out alone at home or at the coffee shop. You can come to the Lodge and surf the Net all at the same time! Bring you laptops to the Lodge and enjoy our new Wireless Network System! Enjoy your favorite food and beverage and chat with your friends on line, check your email, or look at our website and check out our calendar of events. A Big Thank You to Dominic and Jerry Combs for donating the equipment and installing it. Lancaster Elks ER Darin Combs was proud to announce Ivan Mihaljevich as February Elk of the Month. A two year lodge member, Ivan was elected as 5 year Board of Trustee member earlier this week. When you see this active volunteer around the lodge, please thank him on his new position.